Forgot to shop yesterday? You're in luck. Hello, summer! And hello, Memorial Day Sales! As we officially kick off the season, be sure to check out some of the best Memorial Day sales and deals at your favorite retailers. This is a big shopping weekend, so naturally, the Shop TODAY team scoped out some stellar deals and put them in an alphabetized list. Save big on outdoor furniture (barbecue, anyone?) and mattresses, as well as warm weather clothing, swimsuits and shoes for the whole family! Snag deals at Target, Pier 1 and Wayfair, plus many more of your favorite destinations! Shop their Memorial Day home deals and save up to 35 percent! Enjoy up to 80 percent off outdoor furniture and furnishings, indoor furniture, lighting, rugs, vanities and more. Get over $100 off your purchase and enjoy free shipping with the code SAVEMORE. Take 30 percent off home, patio, rugs and Casper mattresses. Also snag savings on select swim items for the whole family, baby clothing, shoes, toys and electronics. In case you missed it, Wayfair launched its Memorial Day Sale early! Shop our picks and more here. It's the weekend to invest in a mattress! Check out deals for Casper, Mattress Firm, Sleep Number and many more. Save 10 percent and free two day shipping when you purchase on Amazon. Shop lower prices on mattresses and receive a free adjustable base (a $699 value) free with purchase! The department store is offering up to 60 percent off top brand mattresses. Save up to $700 and enjoy deeply discounted prices on certain Sleep Number mattresses during their semi-annual sale. Shop Memorial Day Sales at J.Crew, Gap, LOFT and more. Shop womens', mens' and kids' departments for up to 70 percent off. This Door Busters sale is valid online and also includes handbags, jewelry, bed and bath and home! Save 20-50 percent off regular priced items and an extra 40-50 percent on almost all already-reduced items. If you're a Bloomingdale's Loyalist, you'll also receive a $50 reward for every $200 you spend! Score select styles of tees, crops, shorts and dresses at 40 percent off, plus take an extra 50 percent off sale items. The retailer is marking 50 percent off everything in stores and online, including an extra 20 percent off online sales and free shipping. Shop with the code PARTY. During their Sun, Sand, Sale event, take 40 percent off your purchase including new arrivals, both in store and online! Be sure to use the code GETAWAY at checkout. The Memorial Day sale means 40% off... on everything! Valid in stores and online with the code LONGWKND. Enjoy an extra 20, 15 or 10 percent off and use the code MEMDAY in your shopping cart for additional deals. 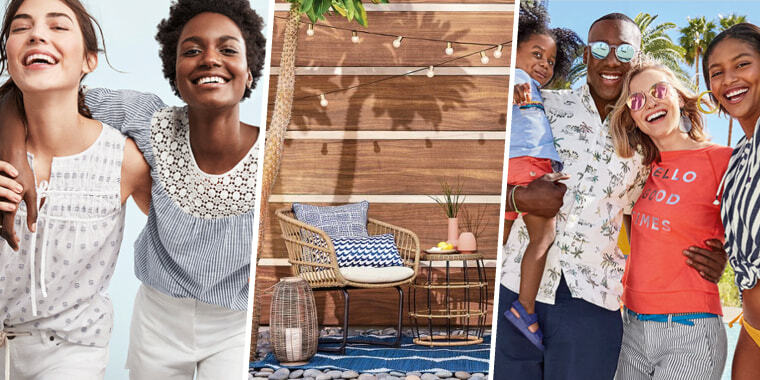 Through June 3, shop Nordstrom's half-yearly sale and save up to 40 percent off on clothing, shoes, accessories and more. Their Wish You Were Here sale includes 50 percent off all tees, tanks, shorts, swim; 30 percent off dresses; and family styles from $5. Select active wear styles are also up to 50 percent off. Shop 40 percent off all items sitewide and enjoy free shipping. Ulta and Dermstore are offering great deals this Memorial Day Weekend. Shop before it's too late! Take up to 20 percent off select brands with code CELEBRATE. The beauty retailer's Gorgeous Hair Event is on until June 2, including deals on hot tools, products and all things hair.